Dome of memorial to the Persian poet Hafez, Shiraz -- Photograph 2008 Via Wikimedia Commons. 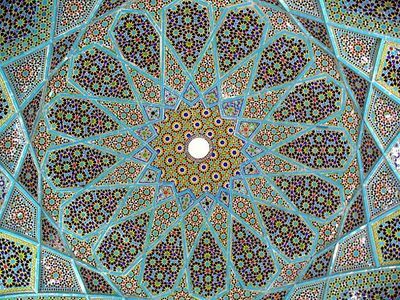 Iran is the country in which the Muslim intellectual tradition is most identified with Sufism, the spiritual dimension of Islam -- including such exponents in poetry and philosophy as Rumi, often reputed to be the widest-read versifier in America today. But as reported by Radio Free Europe/Radio Liberty on Sept. 7, the Iranian clerical establishment has increased a repressive campaign against the Gonabadi-Nimatullahi mystics -- more commonly referred to as "dervishes" -- who make up one of the largest Sufi groups in the country. The Nimatullahi dervishes, of which the Gonabadis are a branch, began centuries ago as Sunni Muslims but became Shiite Muslim believers during their journey toward intimacy with God -- the goal of all Sufis. Recent state aggression against them commenced in 2006, but was aggravated by the Iranian electoral controversy that began in 2009. RFE/RL's coverage was confirmed by bulletins from the news portal Inside of Iran on Sept. 6 and by monitors such as the International Campaign for Human Rights in Iran on Sept. 7. So far, one Gonabadi dervish, Vahid Banani, has died of a gunshot wound, with at least three more injured by gunfire. Their names are Ibrahim Fazli, Asghar Karimi and Mohammad Ali Saadi. All four came from the town of Sarvestan, about 50 miles southeast of Shiraz, capital of the southwestern province of Fars. A funeral for "the martyr Vahid Banani" was held in Sarvestan on Sept. 8, with the participation of many dervishes as well as local residents, although security forces had blocked roads into the town. But the burial took place without conflict. Up to 60 people have been rounded up in different locations. Shops and homes owned by Gonabadi-Nimatullahi acolytes have been destroyed in the town of Kavar, also near Shiraz in Fars province. Kavar is said to be surrounded by security and military patrols. Sufis attempting to enter Kavar have been stopped, with their identity papers confiscated. The most recent government action against the Gonabadi-Nimatullahi followers began in Fars province on Saturday, Sept. 3. The combined reports say the Sufis were detained without warrants, and assaulted by government operatives in plain-clothes and members of the Basij paramilitary volunteers. According to Inside of Iran, early on Sunday, Sept. 4, high school teacher Gholam Reza Shirazi and two lawyers for the dervishes, Amir Eslami and Afshin Kharampour, were summoned to Kavar's government headquarters, but were arrested when they arrived there. A Gonabadi-Nimatullahi website, Majzooban Nour, states that nine people involved in running the site were jailed in Tehran, the Iranian capital, during a raid on Monday, Sept. 5, and that another lawyer for the Sufis, Farshid Yadollahi, was incarcerated on Sept. 11, while more detentions of adherents to the order are taking place. The whereabouts of most of the imprisoned dervishes are unknown. The three surviving gunshot victims, Ibrahim Fazli, Asghar Karimi and Mohammad Ali Saadi, had been under care at the Shiraz Rajai hospital, but Fazli has reportedly been transferred to an undisclosed location. In an interview with the International Campaign for Human Rights in Iran, Seyed Mostafa Azmayesh, international spokesperson for the Gonabadi-Nimatullahi Sufis, and international relations director of the International Organization to Preserve Human Rights in Iran (IOPHRI), said that the repressive actions began in Kavar, but were aimed at dervishes throughout the country. Azmayesh said that anti-Sufi "missionaries" from the ranks of the Basij had been trained in the Shiite seminary of Qom by a special "Commission to Combat Emerging and Pseudo-Spiritual Beliefs" under the direction of the powerful Ayatollah Mohammad Yazdi, head of the Iranian judicial system from 1989 to 1999. The gunshot victims in Kavar numbered six, according to Azmayesh. He charged that a preacher named Shahbazi had toured the suburbs of Shiraz, as well as Kavar and Sarvestan, denouncing the Sufis. According to the U.S.-subsidized Radio Farda, which broadcasts in Persian, the national language of Iran, groups that attacked the mystics chanted "death to American dervishes." Such agitation resembles similar propaganda heard previously in Iran, as well as in Arab countries like Egypt, where Sufism has been depicted as a tool of American policy. Azmayesh, however, ascribed the current repression to conflicts in Iranian ruling circles, with followers of the clerical hardliners in Qom moving against the dervishes because of support the Sufis gave to Mehdi Karroubi, one of the leading opposition candidates in the 2009 Iranian presidential elections, who has defended their rights. The situation of the Sufis in Iran is complex and unfortunate, not least because every attempt to publicize their plight or assist them from outside the country, and especially by American sympathizers, is manipulated by the regime to further attack them. On first hearing of Sufism, people may imagine that all Sufis meditate by turning on one foot in the ecstatic exercise associated with Rumi. Sufis throughout the world study sacred texts and practice "remembrance of God" in many differing ways, some aloud, some silent, some by physical movements in collective observances, some in stillness and solitude. But Sufis in Muslim countries -- not only in Iran -- are associated with resistance to injustice, and some of the most famous of the Persian Sufis, including Mansur Al-Hallaj, who lived in the ninth to 10th centuries, and Shihab Ad-Din Suhrawardi, who introduced "eastern wisdom" to Islam during the 12th century, were both executed for alleged heresy. The acts of oppression visited on the Gonabadi-Nimatullahi Sufis in Iran today are, perhaps predictably, not without precedents in Islamic history.